Infinite Art Tournament: It's Halfway Week at the Infinite Art Tournament!!! It's Halfway Week at the Infinite Art Tournament!!! Two unrelated facts: We are halfway through 2014, and halfway through the Infinite Art Tournament!! Halfway Through the Infinite Art Tournament?!? Sort of! For when Lanyon entered the ring against La Tour on Saturday, they were the 255th and 256th artists out of the 512 that will ultimately be competing in this show! ...or close enough, anyway. If you are enough of a brackets maven to notice that I am fudging a little on this point, you can also see why I'm fudging on this point. We will celebrate the halfway point this coming weekend by kicking off the Fifth Round!!! Kicking Off the Fifth Round!!! 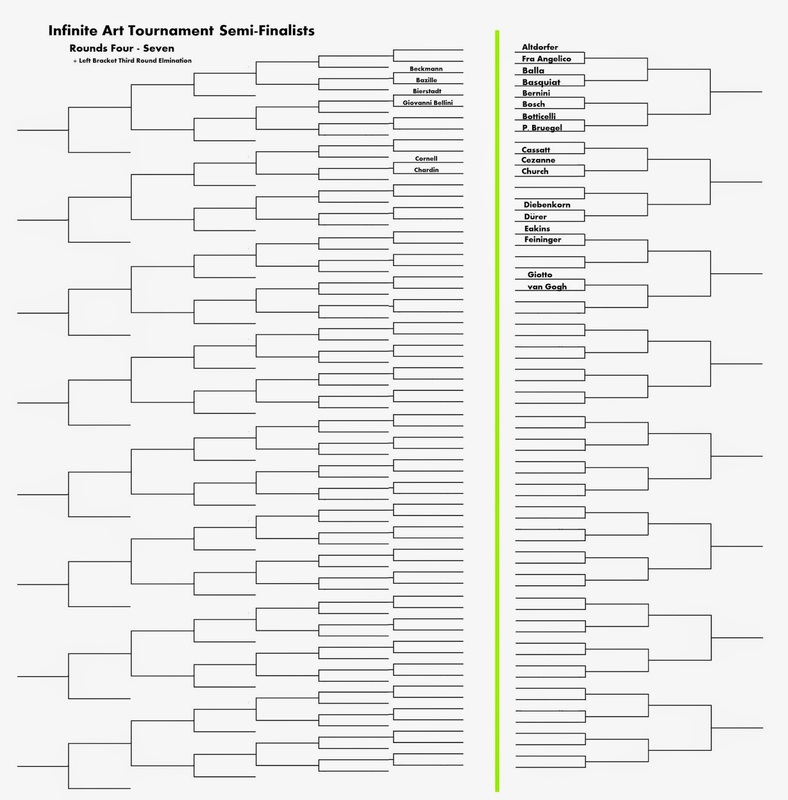 That's right -- the Tournament will make a great leap forward, as the winner of Altdorfer/Fra Angelico takes on the winner of Balla/Basquiat in hopes of reaching the Sweet Sixteen. After that, we'll start a contest from the semi-finals on the first weekend of every odd-numbered month. Meanwhile, we'll still be running Fourth-Round matches on the first weekends of even-numbered months, so you'll be able to start every month with some of the most competitive names in the visual arts! What About the Play-In Tournament? It's all over!! The last remaining details were resolved on Friday, with Escher toppling Bill Viola for a shot at Tournament glory and Wright of Derby successfully defending his bracket slot. You'll see those guys again in a couple of years! Wait, am I confused and/or not enough of a bracket maven? Semifinal means final 4, doesn't it? In this case you mean "final 4 for one of the final 16 slots"? Isn't there a special term for that? Semi, Quarter, Sweet,....Decimosexto... ...?